Why? Line doesn’t come off the spinner fast enough? I’ve done it a couple times. yes electrics are much less physical work. W/ out one, depending on length of trip (time at the tail), depth & current, it can be physically grueling. i was given advice by Dave A at reel seat in Brielle NJ. He’s a local expert. He says at least 500yds of line, probably 600. 50 lb braid to limit drag. I have a Maxell Ocean Max. Works well. People love Okuma Makira two speed but it’s pretty expensive. if you like long boat trips, & bottom fishing, & don’t mike the big weights & time spent cranking, & you can afford the expensive gear & heft prices of the trips, it can be fun & rewarding. I like Voyager, Viking apparently has some nice trips too. There is no joy cranking up 36oz lead weights up from 800’ to rebait Only thing worse is double header dog fish and a 36oz weight from 900’. That’s 300 yards deep If the drift is up you’ll be cranking in 400yds of line each time. Only done it twice, both with borrowed but quality gear. It was exhausting, I’m guessing the right reel would make a huge difference. Too little line, too little weight, too little little. Throw the rod overboard and it might hit bottom 1/2 a mile away. it depend on how deep you going to fish. they fish 600' to 900' deep with electrick reel using sinkers from 10 lb to 20 lb. one guy try to save on sinkers ha cast his own 15 lb concreete sinker,the weight was there but biger diameter,it took long time to get there,he broke 4 sinkers while fishing,that is from $50 to $75 one sinker. it is interesting somting to do,but the fishing is like operating lift to top off building. That must have been some of the most expensive concrete on earth. 80# bag of quikrete is seven bucks. he try to save making his own from concrete,did not wanet to pay for lead sinkers $50 to $75. That guy thinks like me. I was going to suggest disposable sinkers. Free sash weights. Concrete sounds good too. Attach the sinker to your rig with 6lb test mono. Leave it on the bottom when you reel up. Won't work for drifting for tiles but could do it at anchor. This is why I don't go on these trips. I don't think that is "fun"! The only time I've dropped with a pound or more was picking up tiles when the tuna didn't cooperate. That's the way we used to do it. real PITA lugging milk crates full of sash weights onto the boat. 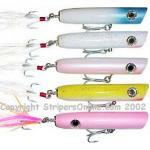 We even had releases that would open with a quick jerk and leave the sash weight on the bottom. Can you still get sash weights these days? 1-5 sounds about right. If you need more than that, get a snack, take a nap & wait for tide to slow. Anyone have experience jigging for tilefish?